Help Us Spread The Word! Green Giant is Partnering with PACER'S Bullying Prevention Center and We Day Minnesota to help parents Raise A Giant and put a stop to bullying in their community. Studies show that an effective way to stop bullying is for kids to simply speak up and say, "That's not okay" when they see bullying happening. Green Giant is asking parents to write a letter to their kids telling them how special they are and encouraging them to be part of the bullying prevention solution by being a giant. Visit RaiseAGiant.com and read the letters others have written. Below is the letter that Erin wrote to her daughters. How is your new school going? Moving isn’t easy but I hope you are settling in and starting to make friends. I know when we were looking for schools together that we were all searching for the same thing. We weren’t looking for the highest test averages or the number of kids receiving reduced lunches… no, we were looking for something different. Something that we knew truly mattered. We were looking for schools where you would feel welcome and where kids would be nice. This was our priority because school is a place where you spend half of your day and feeling happy in that place is what motivates you. It is what makes you want to be in school and want to learn. I know you know from experience, that it only takes a few kind people, a few welcoming souls, to help with any transition. And unfortunately, we all know that the opposite is true as well. Which is why it takes courage to get out there and open yourself up to new experiences and friendships. I wish it didn’t take courage. I wish kids didn’t have to be told by their parents to be brave when setting off for school. I wish kids could be themselves and stay true to who they are and not change the things that make them special. And so my wish for you is simple. Stay true to yourself. Spread your kindness generously. Don’t keep it to yourself or be afraid of it. Remember, you can be kind and strong. In fact, it takes a special kind of strength, an inner strength, to stand up for the things that matter. So, when I drop you off at school and tell you to ‘go out there and get ‘em,’ what I’m really trying to say is to go out there and share what you’ve got. Share your love and compassion. And when you see someone who looks like they might be having a hard day…someone who looks isolated or lonely…someone who may even be wishing that they were the new kid so they could have a chance to start all over, then be that person who can make a difference. 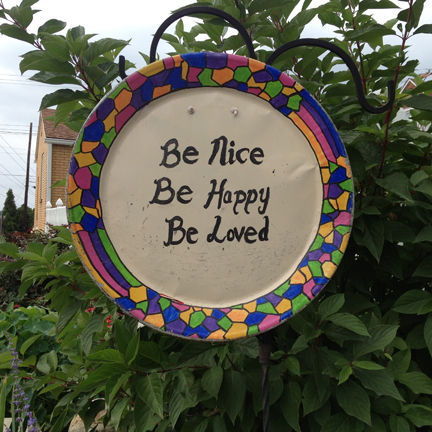 P.S: Remember that simple yet beautiful sign that we saw the other day in that flower garden by your schools? The one that said: Be Nice. Be Happy. Be Loved. Well, when we are settled into our new home, let’s make a sign like that for our garden. Let’s add a few words, though. I suggest this: Be Nice. Be Happy. Be True. Be You. Love and Be Loved. Now… go out there and get ‘em! Erin Frankel is the author of Weird!, Dare!, and Tough!, an acclaimed picture book series on bullying from Free Spirit Publishing.